Johnny Hawkes is a cabinetmaker, designer and pioneer of various inventions, including the Hedgehog Wheel for skating on grass. 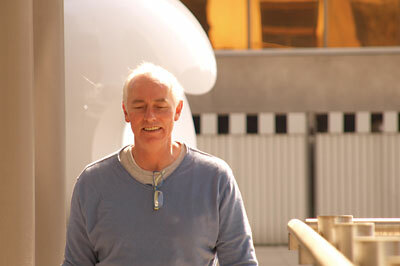 A craftsman for over 30 years, his work is exhibited globally and includes numerous prestigious commissions. Preferring not to be locked into a specific way of working, Johnny works in two distinctive styles, 'sharp' and 'organic'. Johnny Hawkes: Hand carving a beautiful writing table in solid macassar ebony (Diospyros spp.) which I bought in Hamburg 30 years ago. I have waited for a special job to use it on and this is the one. I've been given a free hand on the design and function. 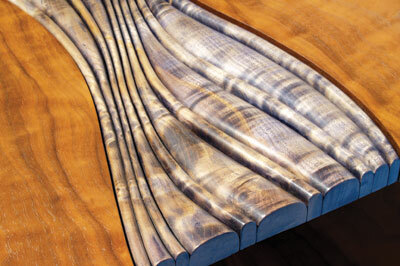 The top is book-matched Kashmir walnut (Albizia lebbeck). I have just finished a new sculpture, 'Mollusc' for a show taking place at the National Arboretum, which I gilded in copper leaf. JH: I failed to pay much attention in school and reduced my class time from 21 to 14 lessons per week, agreeing to spend the extra time doing design and woodwork. I've always loved making things and solving problems. JH: Free time. Sitting on rocks watching tidal water flow up and down. Big surf and crazy riders. Seeing unexpected art which lifts you clean off the ground, when you need a knock to start breathing again. Trying to catch sea fish. JH: Leftfield & Sade at 120bpm and slower dreaming with Pink Floyd. JH: The consideration that you should not waste the incredible resource of so many beautiful timbers. JH: Carlo Bugatti. His work was A1 original, in my opinion. JH: Design, design, design. Fancy dovetails just for the sake of them give me a headache. JH: Maybe, but I also feel we are losing some of the dexterity. 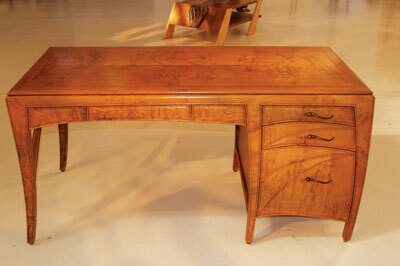 The levels of skill required to make Art Deco and Art Nouveau furniture are hugely different. Whether you want to or not is entirely a different discussion. What is skill is a fascinating debate but generally the UK seems to have dived since the service industries overtook the making and manufacturing. JH: London, New York, Melbourne, Sydney, Rome, Milan. All over the place. It's important to get your work seen and take the setbacks and the joy that comes with it. JH: If it's on the commercial side I've no problem with it, it's not for us to reason why, it is for us but to supply. On the art side, no way. JH: Pretty chaotic. I am a crap draughtsman so it's back-of-the-envelope stuff. I suppose it goes through initial discussions to find common ground. Talks about cost and expectation and if I get a verbal commitment I'll then draw up elevations and plans with a detailed fixed quotation. It's vital to pre-empt grey areas and resolve them. After that the next time I like to see the client is delivery. I'm never keen on client involvement. F&C: Do you consider yourself an artist of a craftsman? F&C: What's the practical process you take when moving through a project? JH: Buying more glasses and finding more light. JH: No, we have spent over 2,500 years coming off the floor, so why go back now? JH: That it is burdened with over-seriousness and the surprise that it receives so little newsworthy press coverage.